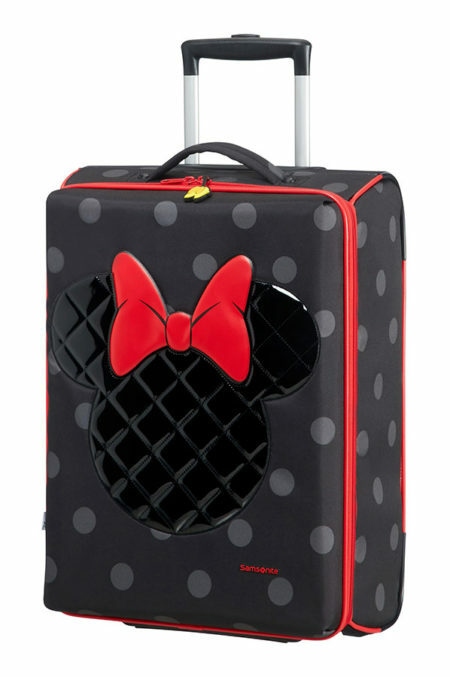 This incredibly chic Minnie Mouse 2 wheel suitcase is the essence of style for any young globetrotting lady. Made with resistant, high quality material in a lovely dotted pattern, it’s clear that dots are definitely the new black! What’s more, the front is adorned with impressive Minnie-shaped, quilted detail in a fashionable shine finish. With ample interior storage, integrated wheels and comfy pulling handle, packing and travelling will be a piece of cake. Don’t miss the cute zipper pullers in the shape of Minnie’s shoes and the Minnie-themed interior lining. Samsonite’s premium collection of kids’ luggage just got even more fashionable. Double tube wheel handle to adjust comfortably to any size traveller. Two lowered elastic cross ribbons.